elcome to Artemis Glass. Established in 1999, we are a family business based in Staines, West London. Artemis Glass is run by myself, Susanne, and my husband Michael Dickinson. We both came to stained glass from very different backgrounds. I studied public art, specialising in stained glass at the Roehampton Institute, London and have 20 years experience in the field. 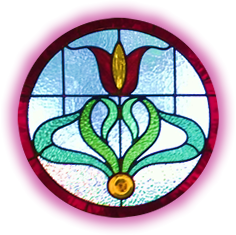 Michael, on the other hand, took up a stained glass apprenticeship upon leaving school in Yorkshire and has been designing and building stained glass and leaded lights for more than 25 years. e like to think that our varied approaches to the craft give an added strength to the quality and design of our work. We cover all aspects of stained glass design, restoration, new work and repairs from residential through to corporate and ecclesiastical commissions. All our projects are bespoke, individually designed pieces created after consultation with the client. 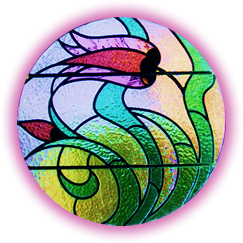 Our designs vary from the traditional, ‘vintage’ and period stained glass to more contemporary, modern and abstract themes depending on the age and style of the property. We offer a friendly and personal service from the smallest leaded light repair to the more complex projects. On this website we have shown a small selection of our work which I hope you will enjoy. I also hope that you’ll share our enthusiasm for design and colour which combined with technical knowledge has produced the high quality end product for which we have become known. Let us inspire you! Call us for a home visit & quotation on 01784 466 192 / 07879 213 392, send us an email using sueartemisglass@gmail.com or send us a message using the form below. Alternatively you can visit our shop at 4a Penton Avenue, Staines, London, TW18 2NB during the business hours shown at the foot of this page. or all work, a 50% deposit is required on authorisation to proceed, the balance is payable on completion. Please note: VAT is not applicable. All goods remain the property of Artemis Glass until paid for in full.